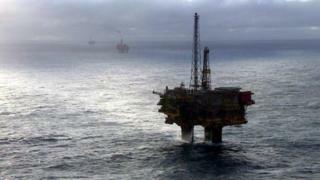 It also called for urgent action to get Scottish ports and fabrication yards "decommissioning ready". How do you pick up an oil platform? The GMB's Scotland secretary, Gary Smith, told BBC Radio Scotland that the costs of decommissioning were "far more than was originally projected". He said the total bill could be "north" of £100bn and taxpayers may have to fund between 50 and 75% of that. Speaking to the Good Morning Scotland programme, he said: "The reality is we have got foreign owned oil and gas companies that are going to enjoy huge tax breaks at our expense and they are taking vital decommissioning work abroad. "That's what's happened with the Janice platform, the Maersk platform which is going to Norway, and of course we had the rig which washed up on Lewis on its way to be decommissioned in Turkey. "So Scotland is losing out on this vital work because of a lack of investment and because of a failure and dishonesty and dithering on the part of the UK and Scottish governments." Lang Banks, director of environmental group WWF Scotland, backed the union's report. He said: "The GMB are absolutely right to highlight the massive liability facing UK taxpayers in order to clean up the mess left behind by North Sea oil and gas industry. "Having made hundreds of millions of pounds in profits over the past few decades, the costs for decommissioning old rigs and restoring the marine environment should be being fully covered by the companies themselves." Meanwhile, Scottish government analysis of fields nearing decommissioning claims their remaining value could increase by more than 50%, or almost £0.5bn, if there were successful measures to cut costs and boost production. Scottish Energy Minister Paul Wheelhouse urged the UK government to increase investment following last week's Oil and Gas UK report which called on government to work with industry to attract fresh investment and avoid premature decommissioning. He said: "The Chancellor's Autumn Statement presents an ideal opportunity to offer the industry the support and clarity it deserves. The UK government must provide support in widening access to decommissioning tax relief to ensure that the full potential of late-life assets can be realised. "To illustrate the potential opportunities, Scottish government analysis of fields nearing decommissioning has identified that the remaining value of these assets could increase by over 50%, or almost £0.5bn, if there were successful measures to reduce costs and increase production." A spokesman for the UK government refused to comment on the content of the Autumn Statement. But he added: "The UK government has provided more extensive support than any other government in response to falling oil prices. "We have permanently zero-rated the petroleum revenue tax and halved the supplementary charge for the industry. "The marginal rate of tax on mature fields has more than halved in the last two years."